Oh boy please let Trump pardon Strzok and let us watch the swamp creatures scatter like cockroaches. Podesta is already on his way to a mental breakdown. Getting comfy. No new news of this nature is surprising anymore. How lefties can get behind the absolute sell out of their own country is beyond me. They are so engulfed in their misery over the loss of the White House they will do anything no matter how reprehensible. I will say it's not all of the left. But yes, what is happening is that many on the left are now cheerleaders for the same establishment and deep state they rallied against during the Iraq war, because they would rather align themselves with these people because they hate trump so much. The ones that do this have no,credibility whatsoever. Wait until you hear about the other members of the Special Counsel who engaged in similar anti-Trump communications. Strzok wasn't the only one. They can put all of the lipstick they want on this pig of an investigation. It's still a pig and a poorly disguised coup attempt. Comey lied to the American People when he got in front of the cameras and said that nobody knew what he was about to say. 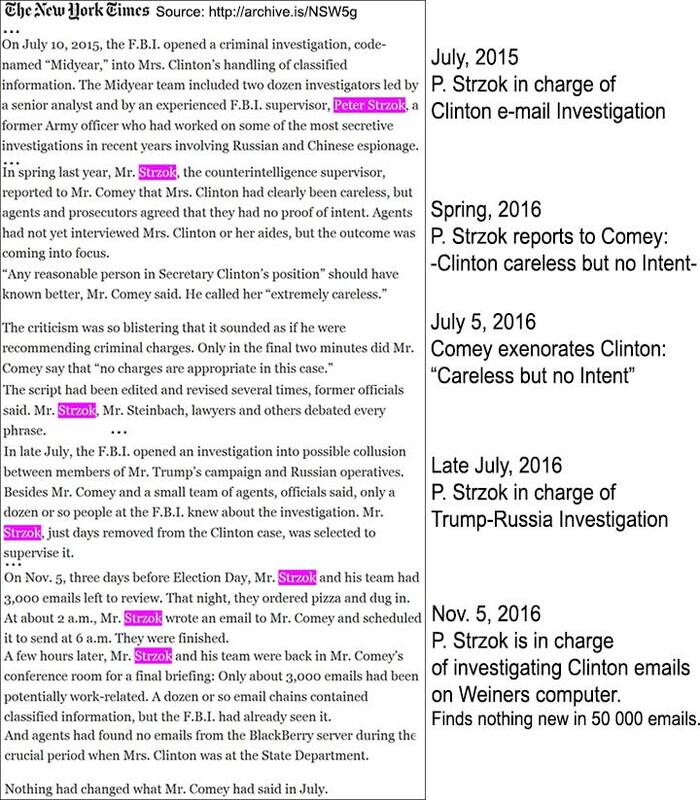 We now know that Strzok must have known because he is the one that edited Comey's original words. Obama's justice department, including the FBI, has lost all credibility in the Hillary Clinton investigation. I believe Strzok is also the agent assigned to investigate Anthony Weiner's laptop that was found full of Hillary Clinton emails!! If the American People are ever going to regain confidence in the FBI and the DOJ again, Justice must be done. Obama's Justice Dept. and FBI must be investigated. They let the American People down. All of the hypocrites at the FBI who engaged in their own politics against Trump, while using their politics to shield Hillary, should be convicted of some crime and then killed in public with very dangerous and potent experimental chemical weapons. If they would just do something like that, the swamp would drain quickly. They can put all of the lipstick they want on this pig of an investigation. It still a pig and a poorly disguised coup attempt. I don't think your statement here is an exaggeration. I think "coup" is the perfect word to describe what has been happening. I would say there are people that were positioned to attempt to carry out this very thing. It is called a "soft coup". The American People must demand justice for what was perpetrated against Mr. Trump during his campaign and even afterward, especially between Nov. 8th 2016 and Jan. 20th 2017, and the witch hunt since then. Then we need to demand justice be done regarding Hillary Clinton and any others that sold us down the river. you remember the "trail of breadcrunbs" bs that the msm plastered everywhere? how was that legitimate now that we know this? I got you covered. JadedANDCynical deserves the credit though. Pleaase don't star this post.